September 5, 2002: There's new informations - reset security code etc. This page serves mainly for people, who already have this phone and want to know as much as possible about it. Also this page doesn't describe how to use it (you can read the manual you bought with phone). Here I will write something on the phone features and its major and minor bugs. If you are making plans about buying the phone, I won't to have bad influence on this, as you can get the feeling this phone is bad. It's not the truth, but I simply wil not describe mobile phone positives (all the functions mobile has as works right) too much. I create this page also because during phone gradual checking I find out lot of interesting things, which wouldn't be good keep in secret. Many pieces of information I mention here I find out with method attempt-error, so some of them doesn't be valid always and everywhere. I will describe my experience, which result from firmware version 4.6.2.3/4, SAT* C320 and browser version r015u+w6+11. Some bugs result from lower firmware version, probably 4.4.x - I didn't know the code for firmware version detection these days. As far as some mistakes occur on older fimware versions (I notice it there), they are written by experience other people and mostly occur on firmware version 3.x. Because this phone has close relationship with Sony CMD-J6, it's possible that some pieces of information are valid also on that phone - but definitely I cound't say. Some technical details are carried from other sources - these sources are listed in the footer of this document. Information on this page are published regardless of their pertinent patent wardships. Products names are used here without explicit free usage permission so they can be the registered marks of their owners and organizations. You can recognize reset by screen becaming more dark or blinking (sometimes even screen shrinkage into one horizontal line in the center), resulting conkou and switch-over into emergency state, with its net searching and also "white-hot" SIM card. During reset there are erased all messages stored in phone (both sending and receiving on display) and "Last Message", so if you are just writing SMS you can became angry soon. While beeing frosed your mobile phone ignores keys press and Jog Dial press, so you can get respond only for rotation its wheel. You are not able to switch off the phone normally, the obvious way is removing and and re-inserting the battery. I've discovered better way how to do the phone reset (see chapter Howto make phone reset). Sometime you can see really extraordinary behaving, but exeptionally only. It's happened to me: my phone beeing in emergency state made powerdown itself, but without the screen becoming black, so it was still displaying its contents, with time stopped. After my long red button press, the phone switched itself on normally. Another excetioptional case was, when I stepped in the message list, but I wasn't able to read any; the machine didn't react. Switching off and on did help. From time to time the are situations, that although phone looks like having standard signal, it is impossible to dial from or call in. This state is only temporary, definitely will help switching off and on, or simply leaving the phone alone, it will reconnect to net itself . Mobil phone shows 3 lines in emergency state: current net, time and my operator (whose SIM card I have). Last row has to be shown, only when being in foreign net over roaming. With older firmware sometimes there are shown all 3 line at home net also, for example notice PAEGAS CZ is displayed twice. This however doesn't need to occur having other home operator. This mistake shouldn't be in firmware version 4.6 (?). As far as you can see operator twice, new firmware upgrade will be sufficient correction. Sometimes there are situations in Sand Art (sand dropping) game, that sand could get across right screen margin. In this case the sand stopped dropping and it is impossible to start again. One solving is middle button press, game saving and reloading (saving and reloading game isn't in manual - see chapter Games features). The error there however keeeps place, I haven't discoverd how with to beat it (try phone switching off and on). Either it or will be going right or not. This error hasn't influence over other function phone - for instance it is possible to finish the games whenever. This error don't occurs too often, just imagine: you are going by tube, somebody is just calling, you are going to answer it, but before completition you will get out of reach signal. This lost talk wouldn't be stored however and if you haven't seen who did the call, you probably wouldn't know never. While you are sending e-mail over Microsoft Mobile Explorer, you can put in as many as 800 characters. If you would acknowledge the message and reenter the "Body" field again, there will be displayed only 649, sometimes 660 characters. Meanwhile I don't know unfortunately, whether really all 800 characters will be send. It's possible to record 5 two-seconds and 5 10-seconds tunes into the phone. There is minor bug however, when you already have your sound recerded and you are going to play it in the recording environment. So you go into a place "My ringers" and choose appropriate ringing. Playing the sound first time, you hear: it's about bit shorter! Repeated playing makes sound be heared normally. Voice mail number is stored in the phone all the time and could be choosen by long button "1" press. But if you have choosen "FDN Entry Only" in "FDN Phonebook", it's impossible to call voice mail this way! It's so, although its number is stored as fixed (and hence permited). With older firmware (about till version 3.X) it's possible, that no number beginning with asterisk could be dialed. I haven't tried to break this, because I don't have such a firmware, but perhaps there is no other choice, than calling an alternative number not beginning with asterisk. Sometimes you can see, that "Call History" shows, that you got ring or called to somebody, who you haven't know before. How it is possible? If you call someone, someone calls you or you only "ring" someone, this call will be written into phone as an event. This event consists from several parts: phonenumber, time and date of call and position in list, which corresponds to telephone number. And this very position can cause mistakes. If you would erase this name from the list, there will no name displayed here. As soon as you insert somebody else's name, it will lie down just at this free position. Event thereby changes - new name will be shown, but with right number. As far as you are then on doubts, if it is the right name, than for this event enter "change" and simply start the call. Right name from list will be displayed than. When you have recorded some sound, you have this sound in the ringers list also. From time to time it happends however, that during change from recorded sounds to normal ones you make the phone mad: you can hear jerky recorded sound together with playing normal built-in tune. This behaviour is however rather "cosmetic" bug, there is no influence on other phone functions. While writing text without T9 dictionary with you can see sometimes, that phone itself randomly switches uppercase letters to small ones. With older firmware it occurs at the beginning of writing. Status bar displays "Abc", i.e. first character is in uppercase, but nevertheless the first letter is in fact in lower case. New firmware versions have other bug - when you type lowercase letters ("abc"), you type a characters and at once switch 1st uppercase ("Abc"), phone itself switches to lower case. The only preventions of this are either delay on about half second, till phone stop waiting for repeated keystroke and it will want new letter already; or typing always with T9 dictionary. With typing there is other bug also. While having set "Abc" and you delete a character, all the time "Abc" is displayed, but now you will type all in lowercase. With T9 this error occurs only in the case, when deleted character is space. While writing messages with enabled T9 dictionary, there will be displayed the most frequently used word always on the first position. To use other word, you select it by Jog Dial (wheel). As far as you focus the word requested and press '0' (space) to contine, the original word you have choosen will be replaced by the first one, the most frequently one. Then to correct selection the focus is not enough, but pressing Jog Dial to acknowledge is necessary also. This bug was fortunately in former firmware versions, in new ones is not. As far as you have you the phone with this bug, upgrade the firmware. Selection list from available T9 dictionaries will be displayed only in case, when on our phone you have choosen the language, which has its own dictionary. For example beeing Slovakian with Slovak language set, you cannot type with T9 dictionary for any language, because Slovak T9 isn't in your phone (somewhere perhaps yes, this is only for instance). I don't know, if that isn't the purpose, but virtually it is a nonsense limitation. While writing you can press "#" for additional characters showing. As soon as you have only one character left, some characters your phone don't offer. They are these: backslash, euro, tilde, circumflex, both right and left complex parenthises, right and left square parenthesis, vertical slash and enter. However there isn't reason for this, because all these characters take as much space as the other. When you insert SIM card from other phone it could happend, that some name get wrong order in list and therefore it is impossible to search for it. You can correct this by "Edit Name" and acknowledge. Name will be sorted right than. If you choose "Bebop" or "Alhambra" as an ending tune, the music is so long, that the phone will switch off before the tune ends. In practice it looks as a simultaneous start sound playing together with ending animation. When animation ends the tune plays about 1 second with black screen, then tune aborts and mobile phone switches off completely. You can count this error as user mistake - he has to select other sound. The phone would better do not offer these two tunes at all. To prevent this always turn loundness on maximum before finishing the call. If you have finished it yet, so briefly start dialing some number, increase a loudness and immediately hang on. There is a bug, while writing message just somebody calls you. You can see on screen incoming call, but in top left corner is white space with blinking cursor in it. Ridiculous is, that when you further continue typing or deleting with red button, cursor moves normally! You can leave this state either by middle button presing or by erasing all all imaginary characters (fortunately not more than 5) and then you are able to answer the call. It doesn't matter, whether you write with T9 dictionary or not. Error has the same scenario and characteristics. You can get this error if user clicks middle button in scheduler, chooses Delete and Past. All old records are erased normally, but if there are some comments in the next month, these days will be underlined in actual month. Count of underscored days correspondis with old entries count. This bug disappears either if user enter the same month once again or he (she) goes over these days with cursor. This bug hasn't influence on functionality, nevertheless is confusing. When the phone has bigger power consumption, it could happend, that for a short time display becomes black and then becomes lighting again - phone does blink in a matter of fact. It isn't serious failure, it has no influence for other phone functions. You can get this error often during sending SMS and during incoming or outgoing call. The phone has a little delay for majority of operations - beeig in menu as you choose entry with Jog Dialem you can move with cursor about half second. Errorneous display s for SMS selection. Beeing in this dishes, you choose that you want to read some SMSK and just move the cursor down, you will get the message, you have asked for. But after re-pressing the wheel the status bar displays on the top a name and info of the message, you subsequently touch with cursor! It's necessary to point out, that thereby the error finishes. Both deleting and answering works well for the right message you are have choosen. I have discovered out 2 ways how to restart the phone (i.e. return into emergency state, searching net, "red-hot" SIM card). First way is (it isn't possible in version 5.x): write SMS with lots of ENTER, store it as "Last Message" and then start writing e-mail. There call out text over Last Message so long as there will be at least 200 enters in e-mail. Now after e-mail acknowledge, phone returns into Microsoft Mobile Explorer, the it will think for a moment, then display will blink and the phone will make the reset. Write some message with active T9 dictionary in any language. Press '1', now make move by wheel to any character (You can finally leave the stop character as is, but you must make at least one turn by wheel - this sign do not acknowledge, only do the shift over it! ), then write '7'. When you press any key from '2' into '9' now, phone will write nothing, but the display will blink and the phone will reboot. This error "works right" on firmware 4.6.2.3/4. The third way id possible only na firmware 5.x: Go to Settings -> Preferences -> Select Network and now press middle button. This is 100% method. As far as you find out that your dictionary doesn't contain some word but you would like it there, so do this: Disable T9 dictionary and write word normally by keys. Then is sufficient to do the acknowledge of writing text (press JogDial). This action will process the whole text and all the words, which aren't in the dictionary will be put into it. As you woun't acknowledge this text for some reason, re-enabling the dictionaryi is sufficicient also. Again there will be stored all the unknown words. Now the word is stored in dictionary (namely in all languages) and will be offered also. Note: Unfortunately this method don't work always. For example word "zvonim" into Czech T9 simply can't be put. It's possible to put in this word for other languages, but in Czech with never be offered. The word can contain diacritic - when writing somewhere, where accute characters can be, the word with accute characters will be offered. In other case will be offered in shape without accute. As far as already such word without accute exist, only the existing word would be offered. There is a question also, how to efficiently delete the word. One way is to put into the dictionary as many other words, that they with overfill a memory and so this word will be lost. If you want to erase all the precept words, simply insert other SIM in the phone (original SIM card you can insert back than). You can recall numbers in the phone directory by so called shortcuts. To do this in emergency state write serial number of the name in the list and cross character (#) then. First 9 serials numbers are quite clear - they are stored in the list directory just under phonenumbers. Other serials corresponds to the names, that are stored in SIM cards (not in the phone!) and sorted by creation time. So if you insert the first name, for example "Smith" into SIM card, its serial will be 10. After inserting the name "Bart" into SIM its serial will be 11, because although its enlistment is at the beginning it has been inserted later than Smith. You can detect the serial number simply by clicking the name, in detail selection you click the phonenumber and finaly you choose "View". The following facts I have found after sending lots of messages and making tests, so I don't expect you get them normally. Sending pictorial and sound message on this phone means virtually that after SMS message are put in 7 additional characters, which say to the same phone type (here Sony, which all models I don't know, on J5 and J6 it definitely will go), what a picture and which sound to use. So it is impossible for example send a new picture, because only picture and sound codes are sent, which must exist in target phone already. It means also, that for message itself there are only 153 charecters left. Picture codes are for similar pictures completely different; pictures list with theirs codes are listed below. Reserved byte can have any value, check total must be adjust accordingly. Phone itself arrange here always zero. Sound codes are numbered from 0 to K. Numbers are ordered 0-9, next A-Z and then a-z. Then what in decimail is10, it is here A, what is decimal 4, it is here also 4 etc. If a meggage is without any sound has code 0, the first sound is 1, second 2 etc. Ckecksum is computed by addding individual bytes both codes. For example if picture has code 11 and sound 09, must be add up 1+1+0+9=B, because both individual bytes values and checksum have the same representation as a sound code. Final shape should be (1109B) then. Using codes above we can send pictorial and sound messagess also from other phone types and if necessary from e-mail also. Sufficient to this is to know codes together with ability to calculate checksum only. If there is a bad checksum, message itself will be normal with its "header" in parentheses. With correct checksum but with bad picture or sound code will nessage not contain bad element. You can try this simply when you write on this phone (Sony CMD-J5/J6) with Text Only message type these codes at the beginning its text, then store the message and view again. If you get it with picture and sound, you just succeed in this system. Theoretically phone could contain picture or sound, which it is impossible to call up normally, but practically it's very lengthy to examine this. If anybody have the taste and would find something, what isn't normally available, I will be very delighted, when you let me know. Activate loud listen in 1. Press middle button and choose "Loudspeaker"
Switch off the microphone Press middle button and choose "Mic Off". Similar to switch on. Get into phone main menu 1. By middle button choose "Main Menu"
In this menu you don't find sounds, WAP and e-mail. You can however start another call using phone directory. Now you can speak with two participants and swithing between them. Unfortunately they can't mix together. Strange is, that you can call somebody while playing game. Third man calling You can call somebody either by phone directory or by dialing number. If you want to call somebody from the list, use menu (press wheel), choose "Phonebook" and make a call normally. If you want to dial directly, type the number normally while speaking and press green phone button as usually. This way isn't so efficient, because when calling lines with additional nubers for selections, these numbers are mixed with phone number (Except with disabled parameter Settings -> Call Settings -> DTMF Tones). Get into SIM Toolkit It could be done the same way as from emergency state, when not speaking; by long middle button press. If you have typed DTMF tones before it, you must clear them by short middle button press before you can start going into the SIM Toolkit. While you are using DTMF tones (typing numbers on one's behalf confirmation different action) and you would like them rub out, press the middle button. Numbers (names) which you want to hide must be stored in SIM card (not into phone). Then go to the "Phonebook -> Phonebook Menu -> FDN Phonebook -> FDN Entry Only -> -set PIN2- -&GT; On". Now its possible to call only numberss they are in FDN Phonebook - one menu back. This numberes it is possible to insert and change below code PIN2 too. Beside that you can call on restricted number count (count depends upon SIM card) there are also hidden all entries in the list they are stored in SIM card. Reason of this i don't know, nevertheless it is quite reliable, namely when inserting SIM cart into other phone. There is error while having set Fixed Dial Numbers in voice mail (see Voicemail with Fixed Dial Numbers). It is possible to find phonenumbers in the list by different criteria. Here are you listed basic methods together with lesser-known ones. Phone numbers only Sufficient is start FDN Entry Only (see How to hide numbers stored in SIM card). Then only numbers resident in the phone will in listed (it is possible search them via previous methods. SIM cards numbers only 1) This method isn't much efficient, but it's possible. In emergency state write codes "number#" step by step (see How to use shortcuts), while phone accepts them. After entry display shows phonenumber. Start dialing this (with immediate abort) - name will be displayed. This way is not suitable for frequent search 'cause it is quite complicated and takes lot of time. 2) Remove SIM card from the phone and put into other phone, which has no name in memory (or it can't store them at all). All the names will be nice listed then. By numbers This way virtually doesn't work. Only exception is, you know the whole number - after dialing you will see the name. Note: Theoretically it is possible type last 7 digits - name will be shown too. Sometimes you need to put in the name with some note, but without number. Numbers are required by phone, otherwise nothing is stored. You can write ***, but it doesn't look nice. What about it? It's easy. Go to Phonebook, select Phonebook Menu, then New Entry. Name must be stored in the phone, not in SIM card! As a number write sign + (long hold 0) and acknowledge it. Now you input the name. With this name no number will be stored! Name record it's impossible to copy - phone writes error Unregistered. This trick only with new entries - if you edit number to +, really sign plus will be stored. Because this is as a matter of fact error, it doesn't need to work all firmware versions. On my version 4.6.2.3/4 it surely goes. Because there is very bad games description in the manual you must find out the games control yourself. Goal of PicPuz game is a picture assembling. If you would like numbers as a picture parts press middle button (button between green and red buttons) during playing the game. Hardly anyone knows that Sand Art game can be saved. After middle button press you get two icons. Left icon (dart directed in) saves the picture, right icon (dart directed out) loads the picture. As a picture will be saved only the sand which already fell off. Pictures created in Sand Art game are impossible to use as a phone background. The only way how add new background is to use some software over a cable. *#7465625# (*#simlock#) displays operator nane which blocks the SIM card and number of unsuccessul attempts to unblock. Menu could be scrolled by the wheel. *#6664867# (*#monitor#) I don't know what it will do, as only the phone with older firmware accepts the code (not for me). (*#superfactoryreset#) This code you can activate only when isn't SIM card in the phone too. It destroys all data from phone - phone book, sounds, data in scheduler etc. This is useful for sell phone to other person. I personally strictly discourage to examine, because for exaple for Network lock you have only 10 attempts left! You can lose pertinent guarantee also. These code you must write so that the last character will be hash character. If you write the code badly and then correct some previous charecter by cursor, the code will be not accepted. Code is accepted immediately when written, without call button press. If there isn't SIM card in the phone, or the phone is blocked against SIM card, it is possible to order only codes *#06# and *#simlock# and it is impossible move wheel by Jog Dial while typing them. Codes marked red are valid in other phones also. Interesting things: for code *#release# phone accepts more hash characters at the code end also. When you type *#releas# return to the last digit and finish the code "e" (by 3). After typing hash in the end phone accepts the code, but nothing is displayed. At the end could be any number of hash characters. They have no special meaning, but it strange, that this works only for hereof code. - With locked keyboard you can light up the display by green button press, and become dark either by any other button or by 20 seconds waiting. If you press red button, phone will become dark after half of second. By pressing other button as red one or green one will display become dark instantly. Make light for versions 5.x works only in case you have set lighting on. - You get into SIM Toolkitu from emergency state by long middle button press. - Long wheel press works a little as red button. You can escape from menu by it. Exceptions are in telephone directory and in calling list, where long press works as green button; during text writing - it only deletes the text, but doesn't escape and in games - there the phone responds to wheel press instantly without waiting for wheel release. - You can get latest message by middle button and "Last Message". This works during writing messages and e-mail only. - You can choose voice mail quickly by long "1" press. There is error - see Voice Mail with FDN. - The sign + before the phonenumber you can type by long zero press. - It is possible to send SMS to display analogous to message acknowledge. You can set it in Messaging -&GT; Settings -&GT; Memory Class by choice "Screen". I do not recommed to use this setting for confidential or important data - they can be erased by mistake from display when receiver not expect them so he doesn't notice that something had arrived. - Switching the phone off is possible by very long red button press, so it is not necessary to use Jog Dial confirmation. - Its difficult to detect the exact moment when recipient phone is ringing. If both you and recipient are in normal signal reach, you can count how many times blinks headphones icon (top left). 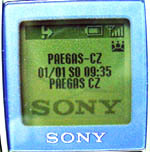 I have examined calls from Czech operator PAEGAS call to (Czech) EUROTEL - phone start ringing after 7th blink, and to (Czech) T-Mobile or (Czech) Vodafone the phone start ringing after 10th blink. - For repeated ringing to somebody are two button clicks enough - the first is from emergency state by green button into last call, the second click will be again green button for calling. - It's possible to escape network list quickly into emergency state by using middle wheel. - While scrolling in main menu it's impossible to obtain any message. It arrives only when you stop browsing through the menu. Incoming call arrives normally. The same is true ohile scrolling the list of incoming/outgoing messages. - Lighting phone display become dark after 20 second inactivity. - It's possible to have for 1 day as many as 10 entries in sheduller; days range is from 1.1.2000 to 31.12.2099. - If discrete profile is set then any SMS arrives with unchanged sound! - Ready alarm-clock doesn't ring on switched-off phone. - While recharging the switched-off phone event from scheduller will be shown. However phone will not beep. - Both received "normal" messages and stored ones are saved in SIM card, message acknowledges on-display messages are saved in phone and are erased after switching the phone off. You recognize these special messages by less highlighted (grey) icon. - Combine vibratory with normal ringing isn't technically possible in this phone - battery not vibrate, but loudspeaker do. - When you have assign private tune to arrival message and you are just playing some private tune when a message comes, it will not play your tune but the standard one (i.e. "Wobble"). - If somebody gives you very short ring and you answer it ("lift up") before real connect (without talking and without caller money lost), then the call will be saved both as missed and received together. - If it is possible to use use middle button somewhere then its icon will be shown in the top right corner. This is not true: in emergency state, during calling, while playing games and in world map. - While reading e-mail phone is able to save as many as 2 kB of text in memory. - Number 112 call is possible also before setting PIN (by typing there, where PIN normally is entered: 112 and pressing green phone button) and also with missing SIM card (the same way). - Majority of operations are performed with delaying. When you for example adjust the contrast and acknowledge this, you may continue changing it for about half second (finally is set the one you acknowledge). The same happens in messages selection. - Phone contains 20 ringing tones; 15 ringing tones for SMS, signalling and scheduller and 1 special one for any event + choice without sound; 10 ringing tones for switching on an off and 1 special one for any event + choice without sound; 20 sounds for multimedia messagess + choice without sound; 1 sound for time beating at whole o'clock = total 61 sounds. Then there is 12 pictures to multimedia messages + choice without pictures, 22 languages, 317 networks (from preferred selection) and 30 caller groups. There exists cover for Sony CMD-J5, but too reduces the sound. There is too tiny hole for microphone (you speak into) so small miscpacing cause you hear nothing. It's however possible to cut out. Worse problem is with small reproductor on back side of phone - for all the ringing. Phone itself is loudly only a few, and because on same place is edge of belt holder it's impossible to fix the place. Nevertheless I warmly advice to use the cover, because convex display tends to harm quickly. Unfortunately I haven't tried software mentioned because it needs cable which I have't. But is applicable for professional deblocking. From emergency state we can quickly change language by setting *#00state_code# (see chapter Codes for phone). What what kind are these codes? I did the job to examine all codes myself - you see the result here. I've find an error also - *#00421# fails your expectation Slovak, but sets Czech. There can be more zeroes in code *#00x# also - max 4 to 6 depending the language. Note: When setting the code *#0000# (zeros can be 3-7 digits) will be set implicit language built in SIM card. In my country it will set Czech. There are no other sypplements and accessories (for example: barter cover, change of below-lightening, new games and addition software) Sony genuine. As far as somebody of you succeeded finding anything concerning this phone, please let me know at mail me. Here's couple of links to further pages about this phone. Description says mainly difference from this page. This aspect was written mainly of mine experience, but also discussion on www.mobilmania.cz and on www.mobil.cz. I thank for unblocking method to Petr Rympl, for phone codes to Rejnok, for technology of vibration to Mustafa, for event in scheduler with swithed-off phone and recharging to Ji�� N�dvorn�k. Codes for different unblocking comes from www.gsmhacking.com. IMEI structure is from a book "Further 333 tips and tricks to mobile" (Czech book). Little more informations about this phone are available only in Czech version.